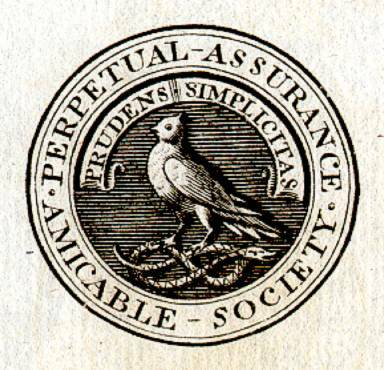 Beautiful certificate from the Perpetual Assurance Amicable Society printed in 1792. This historic document has ornate cursive writing with a vignette of a bird clutching a snake. This item has the signatures of the Company’s Register, and is over 224 years old. Serjeant's Inn, Fleet Street was incorporated by Charter of Queen Anne, 1706, for the insurance of lives. Perpetual Assurance Amicable Society. Serjeants' Inn is one of the City of London’s important historic sites. It is said that during the 16th and 17th centuries the Inn formed the legal centre of England. The freehold of the Inn was given to the Deans and Chapter of York and Canterbury in 1409 and they held it until 1838 when it was sold to The Amicable Society to relieve financial difficulties caused by a calamitous fire in Yorkminster. In 1516 the Judges and Serjeants commenced their long occupation. The "Serjeants" were a "superior order of barristers" from among whom Common Law Judges were chosen. On 4 September 1666 the Inn was completely destroyed by the Great Fire of London. John Hartley, a book seller in Fleet Street, formed the very first life insurance office, The Amicable Society, in 1706, and the Society purchased 50 Fleet Street for occupation in 1838. In 1866 The Amicable Society was amalgamated with the Norwich Union Life Insurance Society.